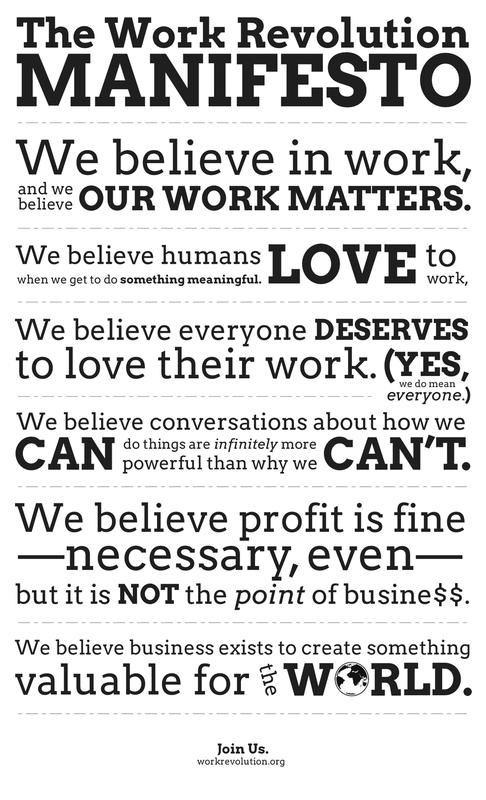 The Work Revolution is a movement + campaign that advocates for human and meaningful work for all. We are the pioneers designing radically life-giving workplaces. So when founder Josh Allan Dykstra asked me to be profiled, I jumped at the chance. Here's my interview about how I work, why I work, how I wish we'd work. And be sure to check out and join this new endeavor. Work Revolution is working hard to make work enjoyable and meaningful. I think you'll like going along for the ride with them. What Tavi Gevinson has done with her personal brand and the brand of her website/publishing empire is nothing short of astounding. Making her success even more remarkable is her age, accomplishing all this at just 16. In every interview I read about her, I continue to be impressed by her wisdom, work ethic, outlook, and values. Case in point: this piece she did with Adweek. Go read the whole interview; it's fantastic. There were a lot of comparisons made between Sassy and Rookie. How do you think you speak to your readers vs. how Sassy did in the ’90s? Our medium allows us to put out more content, which means putting out more points of view. I haven’t looked at my issues of Sassy since before I started Rookie just because I thought Rookie needed to have its own life. And it’s hard to compare because we have a lot more leeway. We don’t really have to please advertisers the way that a print magazine did. Outside of Rookie and going to school, do you even have time for a personal life? Yeah! After I get off the phone with you, my boyfriend’s coming over [laughs]. I just don’t really have time to slack off, which is fine, because I feel really unhappy when I’m idle or when I procrastinate. Everything that I do is either something that I love or necessary to doing something that I love. There’s a lot of decision making, but for the most part, I’ve kind of figured out a way to do everything I want without exhausting myself. The default state of the world is speed. The quest to do things these days, whether it's flip a company, travel to an island, or make a bunch of widgets is the continual quest to do it all more quickly than someone else. "How long will it take?" seems to be more important than "Is it worth it?" or "Does this matter?" I've started slowing down my mornings. And my evenings. I rise early, but no longer is my morning pursuit about speed, seeing how many emails I can answer before daybreak. My mornings are about the slow creation of content, the slow sipping of coffee, and the slow intake of wisdom I find online or in books. At coffee last week, I had the luxury of slowness. My schedule was open all morning, so I sat and talked with new friends and didn't worry about what was next. We talked about parenting, travel, marriage, God - the stuff of slow conversations, topics that if rushed lose any sort of meaningful application. It's spring here and the days are slow as the sun takes its time before setting in the evening. Nature doesn't rush, you know. So my family enjoys the slow preparation of meals and the slow stroll around the block after eating or the slow drawing on the sidewalk with chalk. Besides, there's no point in rushing a three-year-old through anything. Slow is our natural state. That's why we humans do very poorly when things get faster. We make mistakes, overlook important processes, and neglect crucial things that take time to grow: gardens, relationships, legacies, community. By making time in the mornings for things like toast I find I have more time the rest of the day, during those supersonic periods called workdays, where deadlines matter and efficiency is king. I'm rested and focused and can tackle a to-do list with prowess, knowing that my tango with quickness will eventually come to a close when I drive to school to pick up my daughter and slow time begins. The clock may have part of my day, but not all of it. The earth will not spin faster or slower based on our rushing around or our napping. She rotates over and over, not asking if she's going too fast or we'd like to skip a turn. We, too, need that methodical movement, something that both pulls and pushes us toward what's next, all the while understanding that the quest for speed is a foolish one, especially compared to the time-intensive quest for being. This poem by W. H. Auden captures the essence of the expert. Is there a skill, that when you do it, someone doesn't need to look at what you're doing but rather at the look in your eye, your attention to detail, and the passion in your commitment? I first found this poem at Gretchen Rubin's Happiness Project site. I had a little trepidation announcing my new book project yesterday. With a public announcement comes public accountability (due to public expectation). Conventional thinking tells us that if a friend or stranger can hold us to a public goal, we'll be more likely to make it happen. We all have the Facebook friend who's running a marathon, on a diet, starting a business, traveling the world, writing a book, recording an album, looking for a soulmate, building a house, going back to school - the list is nearly endless. Our timelines and Twitter feeds are full of well-intentioned individuals out to change their lives and even the world. But, many fall flat. I've seen company ideas never make it out of the bar they were dreamed up in, fitness plans collapse on the first day of rising early, books end before words are even put on a page, job searches stall before a single resume is sent out, and grad school dreams die before writing a personal essay. And so with some trepidation, I still decided to share my book plans, mainly because I didn't wait to begin the work until after a public announcement. My Evernote is chock full of snippets, outlines, cover ideas, promotional plans, and chapter samples. In other words, I've been hard at work - the announcement was merely a strategic part of this work process. Do you have a big goal? Then get to work and save the announcement. Do this for the reasons Sivers shares in the video, but also do it because we don't want our social networks (digital and tangible) littered with the remnants of best laid plans. We'd much rather have our lives full of completed projects that matter. Now shut up and get back to work. Investment can be a great - but risky - way to create wealth. Whether you want to speculate in commodities, put some money in mutual funds, or write a check to a start-up, investing via ownership can make you lots of money (or cause you to lose it). Of course, doing nothing creates nothing. While stockpiling cash under a mattress means you probably won't lose it if a company goes under, that money won't be making more money, either. It's up to you whether or not to invest, but there's one entity that not investing in will make things worse - yourself. Each of us has ample chances to invest in ourselves. A college degree, continuing education, conference attendance, reading books, sharing ideas, networking - these are all chances to invest in ourselves. Each opportunity costs money, but if they cause your asset - you - to appreciate, it's money well spent. Every year, I invest in myself and spend money and time meeting people, traveling, producing videos, and buying advertising so that I can get more speaking gigs, build my network, and grow the depth and breadth of my business. I consider it all an investment and so far, the returns are great. I also love to see when companies invest in themselves, especially companies I'm a part of. That's why I want to turn your attention now to this job posting from CAMPUSPEAK, the agency that represents me when I speak to college students. CAMPUSPEAK has posted an entry-level sales job, working in a fun environment with people and a business that makes a difference. You get to live in Colorado. You'll learn a lot. And best of all, you're working with a company that will invest in you. You can know this because it's willing to invest in itself by spending money on a position like this, growing its team so it can keep doing what it's doing well. Learn more about the job and if it's right for you, apply. And let this be a lesson that the companies worth working for are those willing to do what it takes to grow, get better, and be around for a very long time. Any company - or person - not willing to invest in itself is one you should be cautious of because its best days are behind it. As I travel and speak to various student groups, there's no doubt that the college system - its collection of academic, social, and communal resources - works. As it did for me (and my parents), colleges and universities provide a valuable experience that prepares one for future endeavors, be they running a business, finding a job, raising a family, or making a difference. This long article (but well worth the read) from The American Interest highlights how online learning is changing the game (for the better) for both students and institutions. But, if institutions don't adapt, they could go the way of music labels or publishing companies. And this data from The New York Times shows the effects of the above article as student enrollment at higher education institutions is decreasing. "What will best prepare me for the future I want?" This is the fundamental question of growing up, I believe. Whether you're 18 or 38, answering this question as best you can results in developing a plan that will help you get where you'd like to be. If the future you want includes you being a surgeon, then there's a pathway to take to get there that very much involves a traditional in-person extended college experience. But if the future you want involves launching a few tech startups, learning to code may be a step in the right direction, which can happen in various locales, the least of which might be a four-year residential university. What makes this all even more complex is that the future you want for yourself is bound to change. The future you want today is to launch tech startups. Let's say you give that a go and six years later you want to be a dentist or attorney. At that point, you'll need to find the appropriate way to get to that future. Learning, therefore, looks different than ever before. I think that my daughter will have several careers, each marked by a period of learning and study. Maybe she'll try one thing after high school for a few years, then enroll in a university to prepare for a line of work, do that line of work, want to shift again, get the schooling needed, try that out, and so it goes. The expectation that one will learn by the age of 22 everything they'll need for a rapidly changing world is now extinct. College, then, is always relevant. The question of when and how it's relevant is what's open for discussion. And the answer to that question may very well differ for each person asking. Universities would do well, then, to be flexible, adaptable, and willing to change as needed. That's very nearly the definition of relevance after all. What do you think? What will college look like in the future to address both the demands of students and the workplace? As always, you can subscribe via iTunes here. Want something covered in a future podcast? Leave a comment with your questions or ideas below. Here's a quick video of me speaking with the good people of Ethics Daily about social entrepreneurship, staying balanced as an entrepreneur, and better focusing on what matters most. Since there's no podcast today, enjoy this video interview. Podcasts will resume on Friday after the first of the year. Happy New Year!